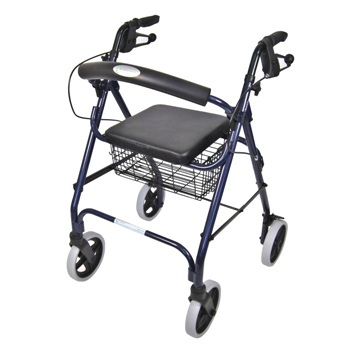 The A Frame Seat Walker/Rollator range feature 7 castor wheels for excellent indoor and outdoor manoeuvrability and stability, with loop brakes that allow for no movement of castors once locked. There is also a low seat height (475mm) version which is ideal for users under approximately 155cm (52). Both models have lightweight height adjustable aluminium frames with loop style hand brakes, seat and basket, with a fold-down curved padded backrest for easy transportation and storage. A clip-on vinyl bag is available as an accessory.